Bringing this series back from WPE, and hopefully I'll do more than 1-2 posts this time. Bask in its awfulness. 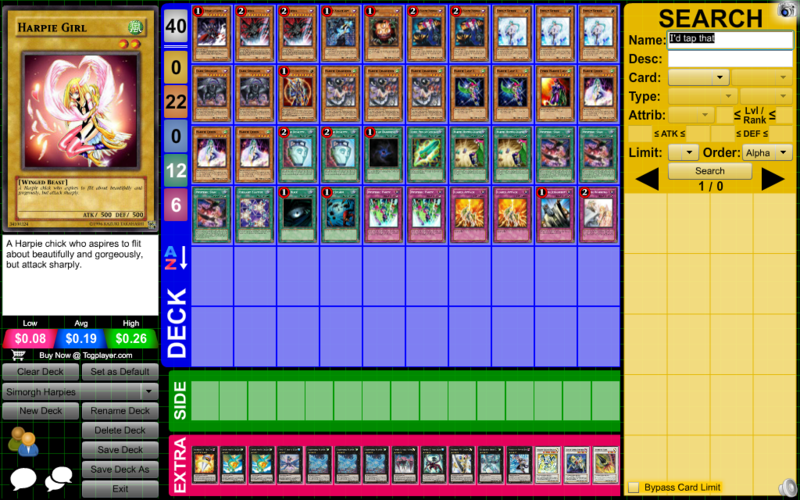 Also seriously need advice because I've never tried this varient of harpie. Planshy wrote: Bringing this series back from WPE, and hopefully I'll do more than 1-2 posts this time. Of course, the one time I say I'm bad at building stuff, the deck turns out to be good. Yeah, I've thought about taking out the quill pen for it, since I want the harpies in the graveyard for both hysteric party, and to banish for Simorgh. Not sure if I'll actually do that though.